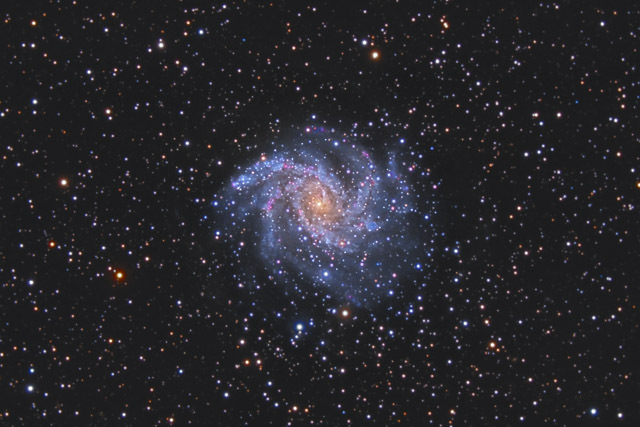 NGC 6946 is a face on spiral galaxy located on the border of Cepheus and Cygnus. 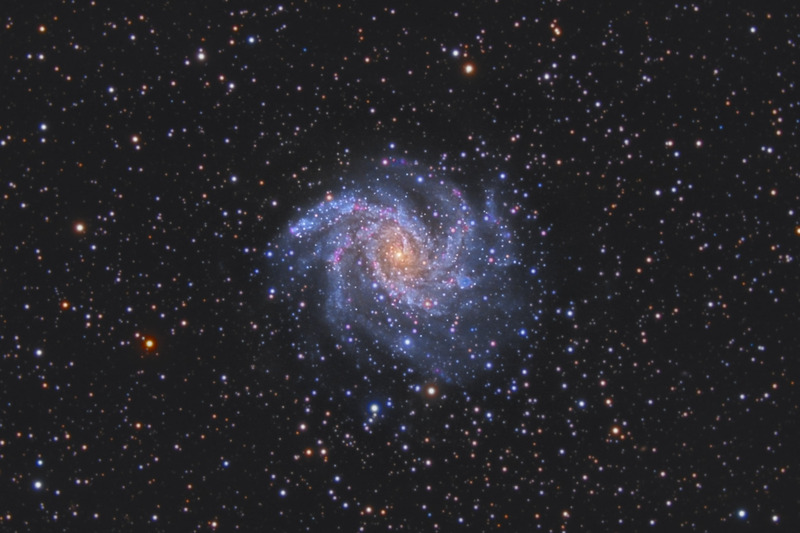 This beautiful galaxy is renowned for having an unusually large number of supernovae - 9 in the last century, thus earning its title as the "Fireworks Galaxy". In this image, North is Up. This image is cropped to 46% of the original full frame. Software Used Images Plus 4.5 for camera control, calibration, stacking, digital development, multiresolution sharpening, smoothing and noise reduction. Photoshop CS5 used for levels and curves, color correction, selective color, high pass filter, star shrinking, lab color, HDR toning, saturation adjustments, screen mask invert, match color, and smart sharpen. Gradient Xterminator for gradient removal. Carboni Tools for additional saturation adjustments, noise reduction, and smoothing. HLVG for additional color correction. Notes I had planned to re-photograph this galaxy for about 10 hours this month, but ended up capturing over 17 hours. Then, I realized I had about 9 hours of excellent data from last year, so I combined it all to make my deepest image ever - 27 hours total integration time! I'm quite happy with the final result - its a big improvement over last year's image.